If you’re over the age of 18 it’s likely you’ve made some mistakes with your money. Even I have made some because let’s face it no one is perfect. So we’re starting a new series on the money mistakes you want to avoid if you haven’t made them yet. Mistake #1: Not saving from an early age. First let me state this mistake is not always our own to claim. I strongly believe that anyone who has a baby should make their first outing into the general public include a trip to your local bank or credit union to open at least a savings account for the child. So if you didn’t have one as a child, this is one time you can rightfully say it is your parents’ fault. Now I understand some parents become parents unexpectedly and that $25 you need to open an account needs to spent on diapers, formula and all the other necessary baby paraphernalia. That’s when taking it old school and getting a piggy bank to save that spare change will help get you there. Once you have the account opened for your child, create a regular savings plan. Determine what amount you can reasonably deposit into the account on a regular basis. Then stick to it! The great part about starting this savings plan for your child is that they have a longer amount of time for the money you deposit to grow, no matter how small the amount. 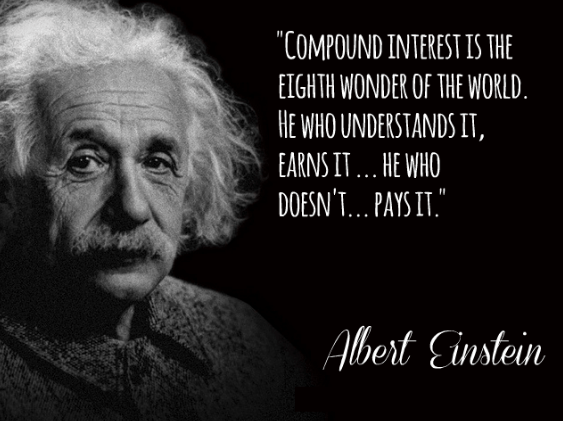 I recently had the opportunity to help a business partner grasp compound interest by stating, ‘You’re earning money (interest) on free money (interest)’. Once you’ve started your child off saving early, it’s important that you include them in the process when they are ready. There’s no set age for this as children all mature differently, but it can be as simple as teaching them what change in your local currency looks like so that when they spot some carelessly discarded on the ground they know to pick it up and put it in that piggy bank you got them earlier. From there you can teach them how to count it, show them how to deposit it in their account, and start helping them to understand how to read their bank statements. So far no complicated math involved. But it’s simple Math, something you can use for your own savings no matter when you started and that you can teach your children once they learn how to divide. To get a general idea of how long it would take to double your money simply from interest alone, divide 72 but whatever interest rate their account earns. For example, a savings account earning 1% (one of the highest rates we could find for a savings account btw) would double in 72 years [72/1=72]. Just one more reason it’s important to start saving early. Of course since you’re adding money to the account it won’t take quite as long to see your money double. But let’s say you want to earn more than 1%. Up until this point we’ve only been looking at regular savings accounts and we haven’t mentioned a specific savings goal. Let’s talk saving for retirement now. Once you have a couple of hundred dollars in that savings account it’s a great idea to go ahead and open a Roth IRA at an early age. That concept of compound interest applies to those accounts also, they can be opened for children, and require relatively low initial deposits, some as low as $100. There are other benefits as listed in this Investopedia article. Talk to your financial professional for more details. Check back in 2 weeks for another money mistake.